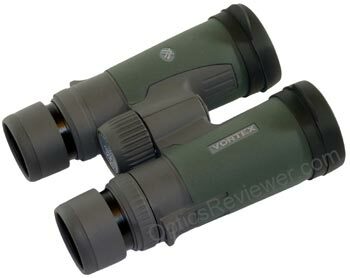 Razor HD Binoculars from Vortex - Apo for Colors and Apparent Resolution! What did we see when our new Vortex Razor HD binoculars arrived? Typically, we look for an infrequently seen or interesting animal when we get a new binocular and take it out into the field. We've had a number of interesting experiences or sightings that we've been able to relate in reviews for other binoculars. It was July when we placed the order for our new binocular and August 2012 when we received the freshly updated 10X42 apochromatic Vortex Razor HD. Circumstances prevented our getting it into use immediately, unfortunately, but we were too interested in seeing its performance to accept much delay. When we got it into the field, we found the normal abundance of wildlife to observe — but nothing singularly out of the ordinary no matter how hard we looked for something particularly interesting to tell you about. There were deer in abundance as we moved through the months of September, October and November. We enjoyed watching the bucks begin sporting their velvet-covered antlers and continued to watch as the velvet dropped away. A number of deer families seemed to graze in close association and we came to know them well enough to be able to identify some of them by sight. As we watched one evening, a red fox meandered through our field of view with many pauses to stop and smell the wind and various bunches of grass as he went. He seemed to be nearly within touching distance as he sat down, yawned widely, licked his lips, and gazed tranquilly at his surroundings — king, he seemed to be thinking, of all he surveyed. As is the case with most foxes, the tail behind him seemed nearly as large as all of the rest of him. These observations seemed to be too common, too ordinary to bring as interesting ones to readers, some of whom are accustomed, no doubt, to more exotic scenes than these. They were, nonetheless, the enjoyable experiences one finds in harmony with nature. These observations typically took place between sunset and darkness and provided opportunities to see how the new 2012 Vortex Razor HD binoculars performed in less than optimal lighting. We waited until we felt we had enough experience with it to be able to write a review that would provide enough information for a reader to feel comfortable with a decision to either get one of these new Razor HD binoculars or go with another choice. This most recent update of the Razor HD binoculars model occurred about a year after the prior Razor HD update and caused some to wonder why the company would go to the expense of performing a major re-design of the optics and housing so soon again. We will consider the differences between the two designs separately and keep to the new model with this review. Let's get on with it and talk about what we found with 2012's new apochromatic Vortex Razor HD binoculars, shall we? Vortex has brought the Razor HD back to the classic "H" roof prism hinge design. We've generally felt that as long as the optical quality was good, we could be happy with nearly any hinge design. Vortex has retained the magnesium chassis for this update of the Razor HD and has found ways to reduce the weight by about 4oz (113g). Part of this weight reduction seems to have come from the diameter of the barrels, since the barrels of the 2012 Razor HD are more slender and easier for smaller hands to hold while not being difficult for larger hands. Returning to the "H" hinge design was another way to reduce weight without sacrificing performance. Why was reducing weight in the body important with this new design? We believe the reason is because the optics design (which we'll talk more about below) carries more weight than the optics of the Razors of previous generations. Optical-grade glass is more dense and heavier than "normal" glass. Our understanding is that the new design has more of that heavy glass than the older ones. As are other Vortex binoculars, this one is wrapped in a layer of rubber armoring to protect it from bumps and scrapes. This armoring is good and makes it easier to hold onto the binocular with cold or wet hands and suppresses the sound a wedding band or other ring might make in bumping against the binocular in use. Of course, this external rubber layer is not what makes the binoculars waterproof. As you would expect in a roof prism binocular in the Vortex Optics Razor binoculars category, these have been hermetically sealed and lubricated O-rings have been used in their assembly to ensure the seal lasts. Once fully assembled, the air inside was replaced with dry argon gas to eliminate moisture-laden air molecules that might cause internal fogging or promote the growth of fungus that can eat away at expensive lens coatings. Since those lens coatings play a major role in how a binocular performs, this is particularly significant for those who will use or keep their binoculars in humid conditions. This sealing is the treatment that seals the binoculars so that what's outside stays outside, whether water or gritty dust. The eyecups on the 2012 Razor HD binoculars are not as thick as on other Vortex Optics binoculars. This thinner-walled eyecup may have simply been designed in keeping with the more slender barrels. It doesn't seem as though it would contribute much to the overall weight reduction, although we suppose it could have been done with that in mind. They adjust from fully retracted to fully extended with two intermediate steps. The action is smooth and the intermediate detents seem to hold nicely, with no threat of collapsing in the middle of an exciting viewing. The fully extended position absorbs 10mm of eye relief. Although many binoculars at this price point are designed with the diopter adjustment being made from the center focus wheel, this model of the Razor HD has a ring at the right eyepiece for this adjustment. To prevent inadvertent changes to the diopter setting, this ring locks and can be unlocked by pulling upward toward the extended eyecup. This simplifies the mechanism and seems likely to be a part of maintaining this Razor HD binocular's quality while avoiding a price increase from the prior generation. The focus wheel turns smoothly with a very reasonable amount of resistance to the touch. The design of the binocular has the weight distributed so that when the thumb indents on the bottoms of the barrels are actually used comfortably, the instrument is well balanced in the hands and the index fingers rest easily on the wheel. Where in the World Are They Made? Although the matter of where optical instruments are made is becoming less a part of purchase decisions, people are still interested in where a binocular is made. Our 2012 Vortex Razor HD has "Made in Japan" along with the serial number below the eyecup on the left barrel. 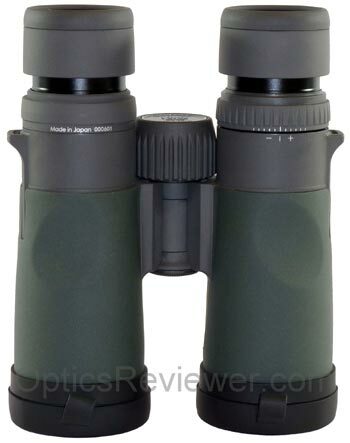 Optical manufacturers in Japan have earned a reputation for quality workmanship and the new Razor HD binoculars reflect it in the close fit and smooth functioning of their various parts. As you may have anticipated, this is where many folks will be interested to see how the apochromatic lens system in these 2012 Razor HD binoculars performs. Our 10X42 configuration has a 6.9° field of view which translates to a linear field of view of 362ft at 1,000yds (121m at 1,000m). The 8X42 configuration provides a 7.4° field of view, which equates to 388ft at 1,000yds (130m at 1,000m). These are average or slightly above fields of view that will allow the user to keep up with the action in most settings. In testing the size of the sweet spot in our binocular's optics, we found that details started to soften ever so slightly (and barely perceptibly) at about 67&percnt; of the radius from the center. At about 80% of the radius from the center, we perceived that the details started to blur slightly and progressively toward the edge. The 2012 Razor HD binoculars provide a good, usable sweet spot and we expect that they will be acceptable to the majority of users. What About Colors with the Apochromatic Razor HD Binoculars?!? Achromatic lens systems, those used in most binoculars, are designed to bring two color wavelengths (typically red and blue) into focus in the same plane and thus present clean, crisp images by reducing the fringing between color areas in the image. Extra-low dispersion (ED) glass in objective lenses helps to improve this further. We were curious about how Vortex achieved the apochromatic view and thought you would be, too, so we asked about it. The apochromatic (also called "apo") lens system, such as is used in the new Razor HD binoculars, is designed bring three color wavelengths (typically red, blue, and green) into focus in the same plane. In the apochromatic Razor HD binoculars, Vortex staff tell us that this is accomplished by using a second ED lens along with a third, non-ED lens in the objective lens area. This apochromatic design, sometimes called a triplet optical design, reduces the amount of blurring or fuzzing between colors in the observed images even further than an optical design using a single ED objective lens. We felt that the apochromatic Razor HD was significantly above average in reducing chromatic aberration. This apochromatic optical design is similar to that used in the Vortex Razor HD spotting scopes and it seems reasonable to think that Vortex elected to use that approach in this binocular update. In conducting research for this article, we noticed that the apochromatic spotting scope seems to be quite well received as an above average value for the money and, based on experience with our Razor HD binoculars with the apochromatic triplet design, it seems likely that the binoculars will be well received as well. In observing colors, we felt that our apochromatic Razor HD instrument was for all practical purposes color-neutral. What is the benefit of an apochromatic lens system? As binocular users the colors appear sharper to us and there is greater observable or "apparent" detail in the images viewed through it. This is easily discernible with the new Razor HD. The color sharpness translates readily to increased observable detail. The difference this presents to the human eye is significant and we believe outweighs the resolution measured on black and white test charts, which suggest that the Razor HD's resolution of details is on the high side of average for black and white images. The light transmission capability of the 2012 Razor HD is very good and, in testing in late evening and semi-darkness, we felt it was competitive with the others in its class. When viewing bright parking lot lights, however, we felt the "spiking" of light out from the light source was not as controlled as we would have liked it to be. Is this significant? It depends on what your intended use is, however for the majority of users, it is not likely to be a significant factor. We felt that this third generation of Razor HD binocular did not control strong light as well as we would have expected it to. In looking over water on a sunny day or in the general direction of the sun, we found glare from the strong light to be evident on occasions when we didn't expect to see any. Vortex Optics specifications for our 10X42 configuration calls for a close focus distance of 6.0ft (1.8m). Our Razor HD's measured close focus distance was just 5.2ft (1.6m). With this short of a close focus distance, we feel quite comfortable recommending the binocular as a bird watching binocular. How Much Depth of View? The depth of view, or the distance over which you can view objects as reasonably focused without adjusting the binocular's focus, is good. Although we don't typically measure the depth of view in feet/meters, we are alert to it and note whether or not we need to continually re-adjust the focus as we change our viewing distances. We felt that the Razor HD's depth of field was similar to other binoculars in its general category and we enjoyed the ease of use this provided. Included with the Razor, we received the very nice Vortex carrying case that feels like it is padded with about a quarter inch (6mm) of closed-cell foam padding such as is used in notebook computer cases. The exterior and interior of the case appear to be a nylon or other durable synthetic material. Two belt loops are sewn onto the back of the case and there is a shoulder strap provided to assist in carrying the encased instrument. The binocular fits quite neatly into the case, without a lot of extra room to spare. Both the rain guard (for the eyepieces) and the objective lens covers are made of a soft, but durable feeling rubber about a sixteenth of an inch (1.6mm) thick. They tend to slip on relatively easily and, although a person might reasonably expect them to slip off just as easily, we didn't have any difficulty with that happening. 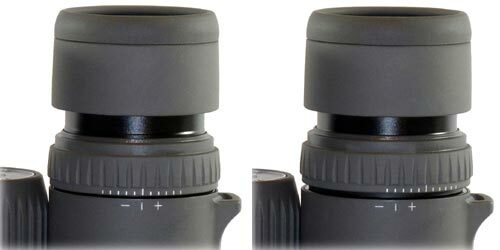 The rain guard has a bridge that flexes easily between the two caps for the eyepieces. The caps themselves are about three quarters of an inch (19mm) deep and have a slight taper in toward the bottom. The taper ensures that they fit smoothly and snugly to the eyecups, yet are easily slipped off when we're ready to use the binocular. When we think we run a risk of losing an objective lens cover, we'll simply remove them both and leave them in the box. We found that we left the Razor's lens covers on the binocular when using them in the field and had no difficulty with them slipping off unintentionally. 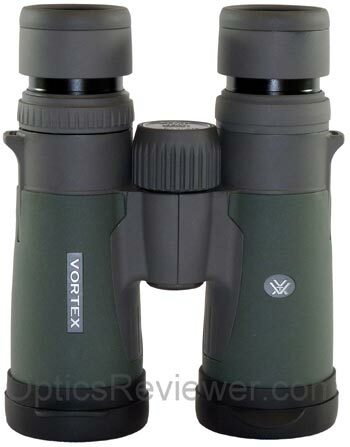 This update of the Vortex Optics Razor binoculars is brighter, has a greater apparent resolution of details, is relatively light and is well balanced, and easily handled. 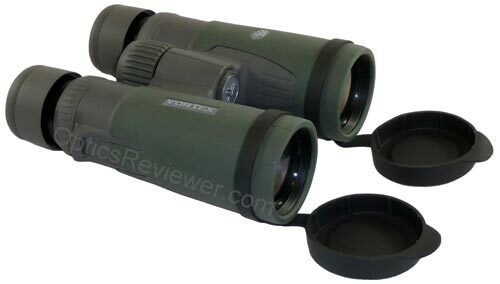 We really like it and have no difficulty recommending it for bird watchers, hunters, and others who value quality optics. We consider the construction and optics package to be above average with very few apochromatic binoculars available as this review is written. When buying a Razor HD, we found the lowest internet prices to be the same at both Amazon and Eagle Optics for buyers in the United States. These links will take you directly to the Razor HD selections at these retailers: Amazon.com and Amazon.co.uk to our friends shopping for the Razor HD binoculars because of their high customer service commitment. We are also selling our test binocular, featured in the pictures on this page, and you can check it out on our Optics for Sale page. 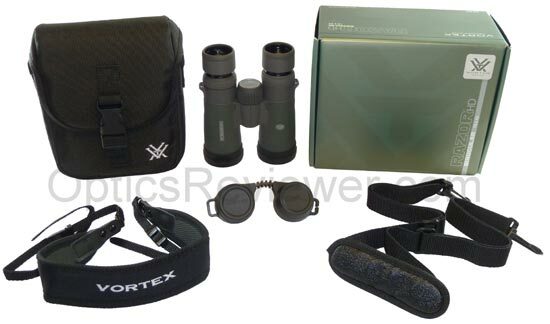 All Vortex Optics binoculars come with the Vortex VIP warranty which says anything that happens to a Vortex binocular (other than loss or theft!) will be repaired or replaced by Vortex at their option. If you give the binocular as a gift or sell it, the warranty is extended to the next owner, too, without needing to present proof of purchase. We don't know of a better warranty.